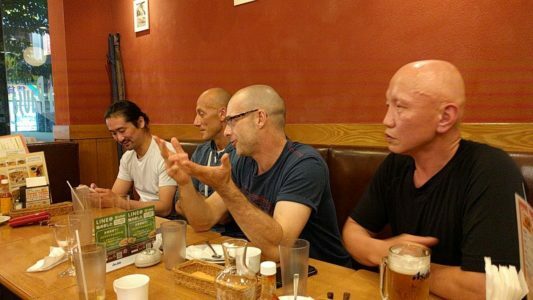 See Free Tokyo Open Seminar 2017-08-13 for seminar announcement. 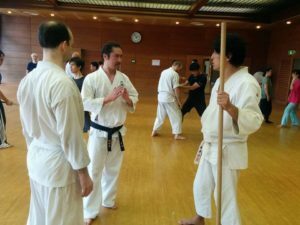 This post is a report after the seminar, given by Aunkai Hanshi Kazuhisa Miyakawa, to offer an introduction to the Aunkai method of training, with its salient points explained in as simple a manner as possible for both beginners and practicing students. 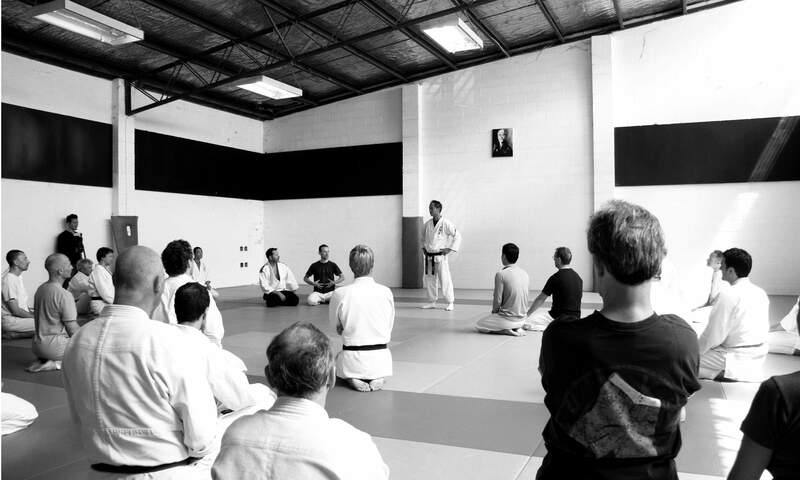 Thank you very much for attending the Aunkai trial seminar on August 13th. 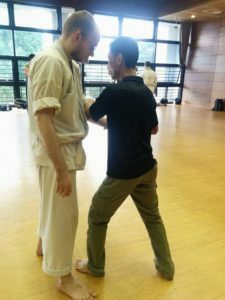 I hope you enjoyed and understood Aunkai method. I would really like to see you soon again. The seminar garnered attention for being free, and is a milestone for the Aunkai organization in being the first seminar in Japan given by Miyakawa hanshi. It turned out to be very successful and a pleasurable experience for all participants, making full use of Miyakawa hanshi’s extensive experience teaching overseas in Europe over the last few years. 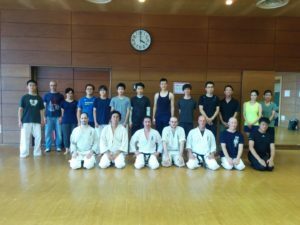 Attendees numbered 23, with about 10 members from the Aunkai organization among them, as well as a few repeat attendees who had experienced Akuzawa sensei’s seminars before. Miyakawa hanshi began with a brief overview of the Aunkai method, demonstrating with French instructor Richard Segissement (kyoshi) as his partner. The main point conveyed were the use of a connected body to transmit center of mass without pushing off the ground, punctuated by demonstrations with the rokushakubo and with empty hands to move the partner seemingly effortlessly, when compared to trying to do the same thing with so-called ordinary strength. 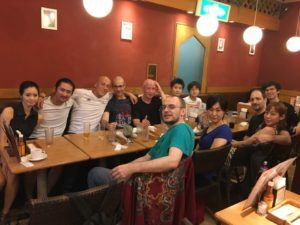 Since the seminar was 3.5 hours long, and the day humid and hot, there were water breaks every 30 minutes or so, giving people time to regain their energy. 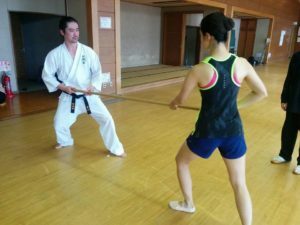 The exercises Miyakawa hanshi had participants do are all standard Aunkai partner warm-up exercises, and the focus was purely on feeling a connected body, and obtaining a sensation of affecting the partner through transmission of center of mass with relaxed hips and without any use of the knees or upper body tilting. Pushout proved to be a popular exercise, as it has been found throughout the world where Aunkai is spread! 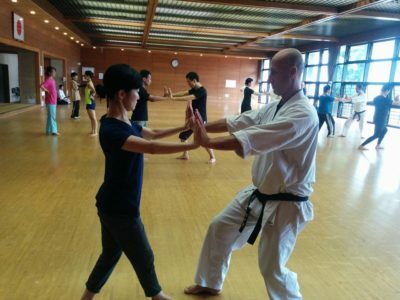 Finally, some breaking balance exercises were done for the last 20 minutes or so, giving participants a feel for how relatively easily a partner can be affected. 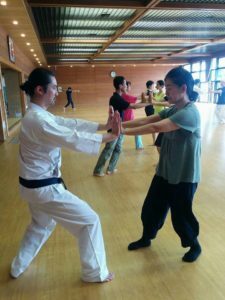 the partner, the idea is that it would be easier to grasp the essential elements of the tanren. After the seminar a number of participants joined in an impromptu dinner and chat until evening, bringing to an end a very enjoyable day of mutual training and learning. 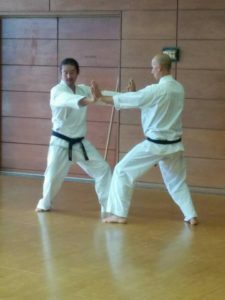 Miyakawa Kazuhisa hanshi with Richard Segissement kyoshi demonstrating transmission of center of mass. Miyakawa hanshi demonstrating with Richard Segissement kyoshi. 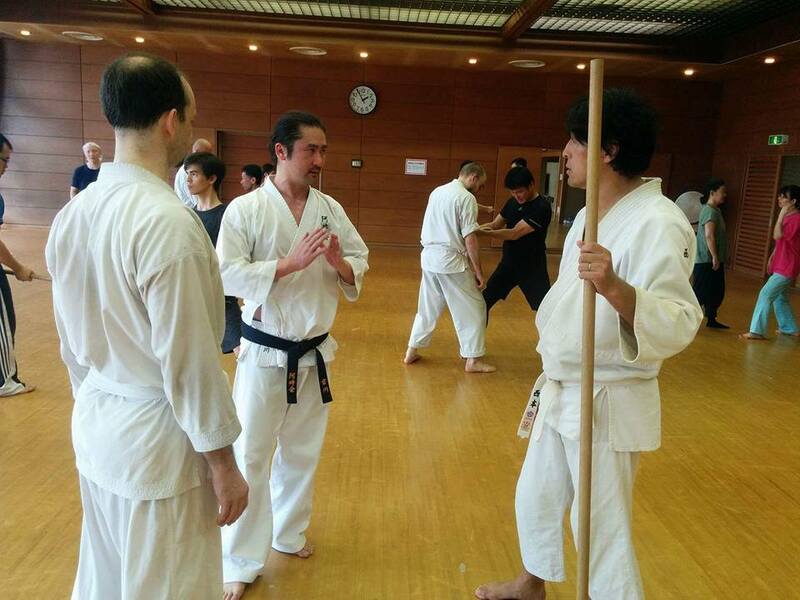 Miyakawa hanshi explaining to attentive seminar participants. 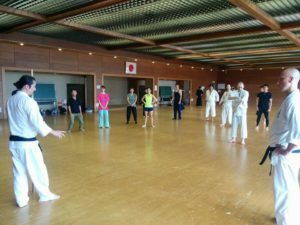 Miyakawa hanshi explanation importance of collecting the body together. Miyakawa hanshi demonstrating transmission with finger against resistance. 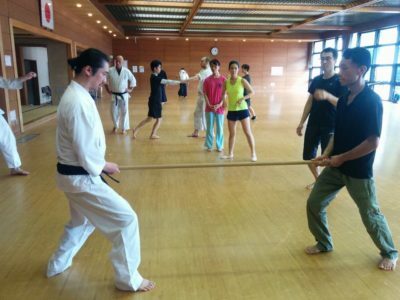 Hatta-san and John Robinson practicing transmission of center of mass. 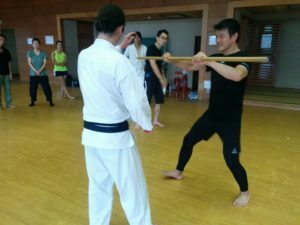 Miyakawa hanshi demonstrating center of mass transmission with seminar participant using a rokushakubo. 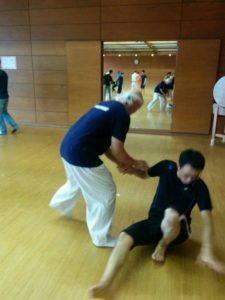 Miyakawa hanshi demonstrating partner walking exercise with seminar participant. 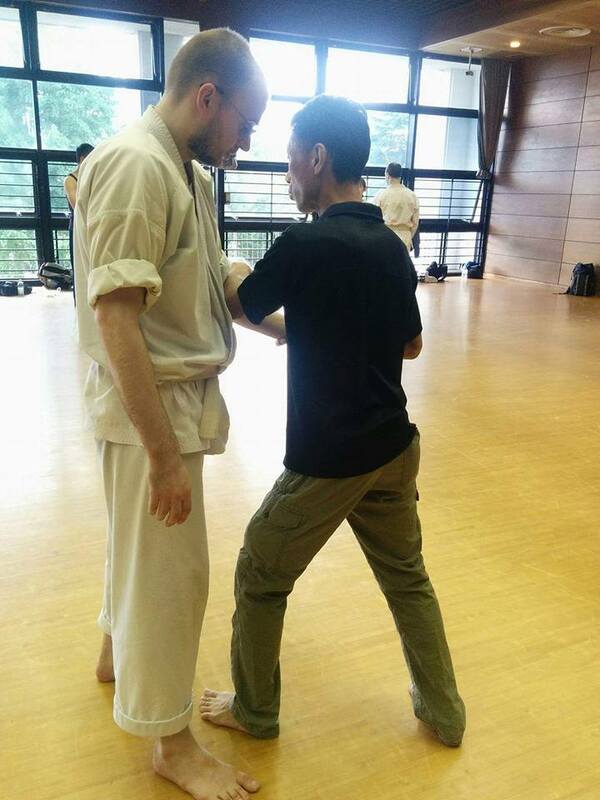 Richard Segissement kyoshi practicing partner walking exercise with seminar participant. Hatta-san and a seminar participant practicing breaking balance (kuzushi). 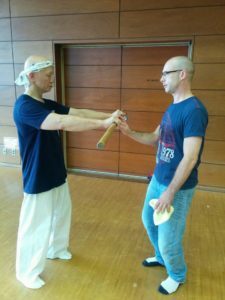 Glen Braun and a seminar participant practicing breaking balance (kuzushi). 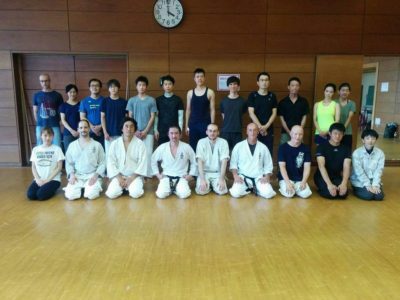 Group photo at end of seminar.